What tweens don't love the Star Wars movies? 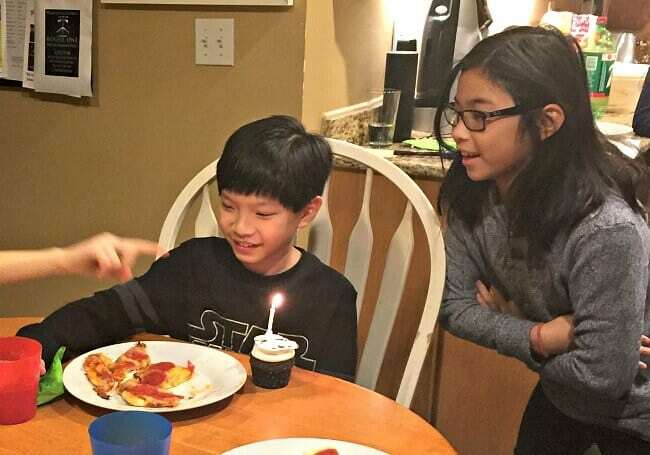 When my son's 11th birthday coincided with the release of the latest Star Wars film “Rogue One”- we knew we had a theme that would be perfect for kids birthday parties! 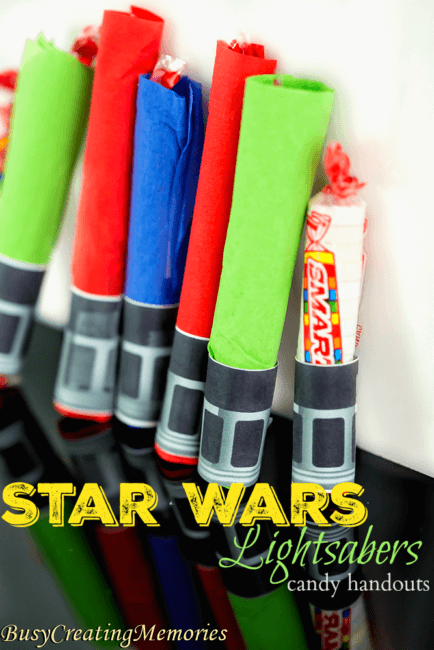 I'll show you what we did at our Star Wars themed sleepover party along with some other great Star Wars Party Ideas for Tweens! 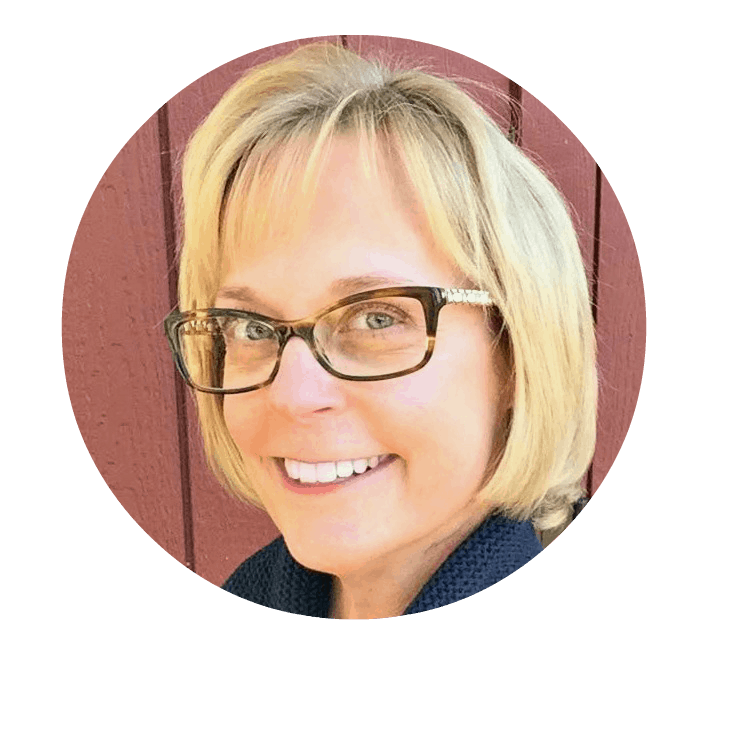 I distributed popcorn and water bottles to our guests, and we settled in for a fantastic movie (truly- Rogue One This is an affiliate link: MomOf6 earns a commission if you purchase, at no additional cost to you. was all kinds of AWESOME!). 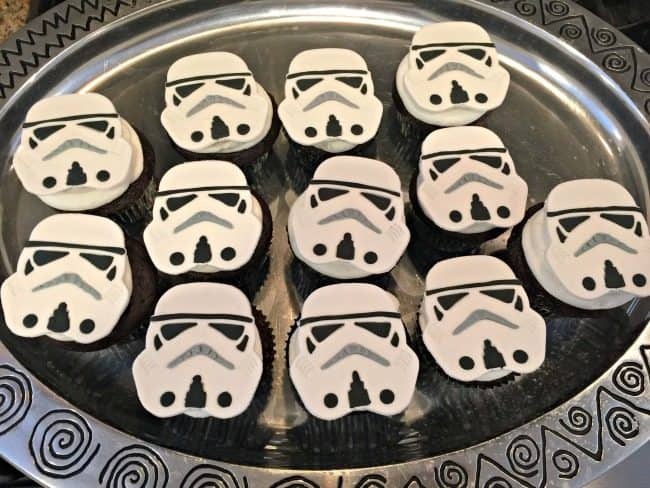 After the movie, we returned home where the kids made their own mini pizzas and enjoyed these cupcakes that were made with these cool Stormtrooper cake toppers This is an affiliate link: MomOf6 earns a commission if you purchase, at no additional cost to you. I found on Etsy! And I forgot to mention that my son dressed for his party in a Star Wars-themed tee shirt that we found at Kohl's ( similar to this one here This is an affiliate link: MomOf6 earns a commission if you purchase, at no additional cost to you. ). 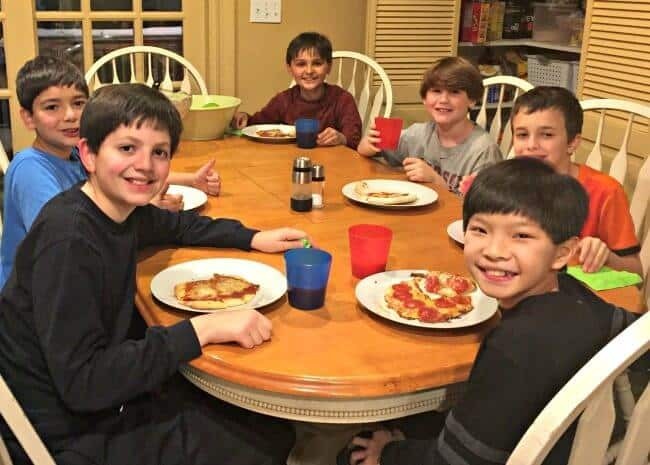 After pizza and cupcakes, the boys spent time playing Lego Stars Wars This is an affiliate link: MomOf6 earns a commission if you purchase, at no additional cost to you. on the Wii U before settling down for the night. 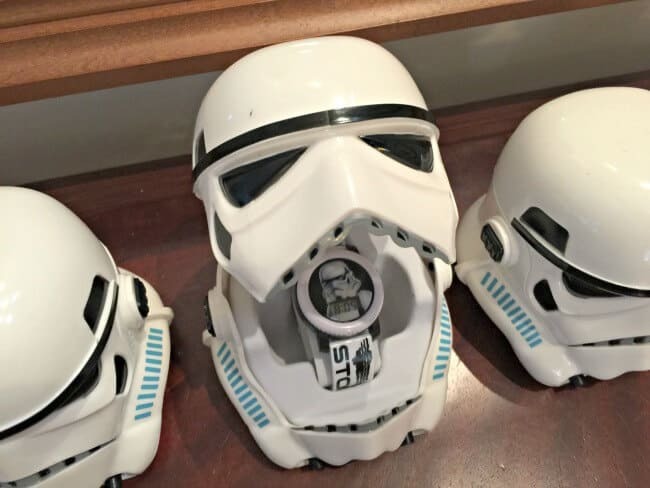 So now that you've seen what we did at our Star Wars themed party…. let's check out some more Star Wars Party Ideas! 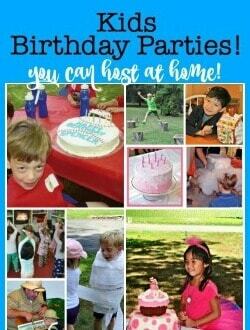 If you are looking for free printable party invitations, thank you notes, and food labels- I think these ones over on All Things with Purpose are fantastic! At lots of our home parties, I divide the kids up into teams- giving them different colored tee shirts to wear (which becomes one of their party favors). 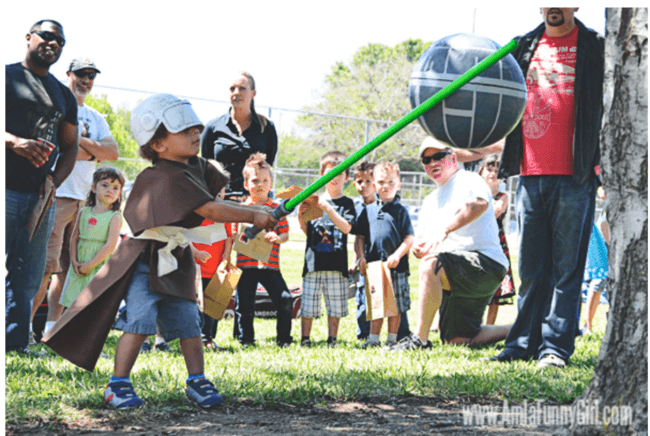 But they upped the game over at More Than Thursdays– with these DIY jedi costumes ready to outfit all of the guests! 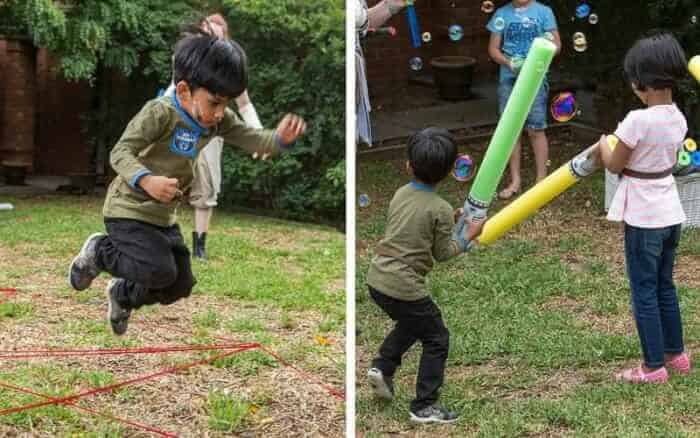 Sunshine and Hurricanes has some great ideas on how to make lightsabers using bubble wands This is an affiliate link: MomOf6 earns a commission if you purchase, at no additional cost to you. and silver duck tape This is an affiliate link: MomOf6 earns a commission if you purchase, at no additional cost to you. 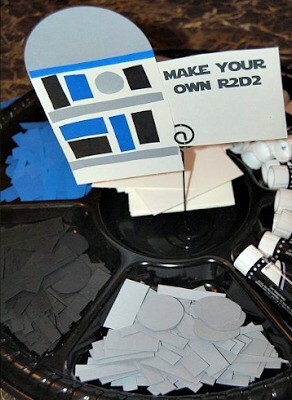 , and then use them for various lightsaber birthday party games! 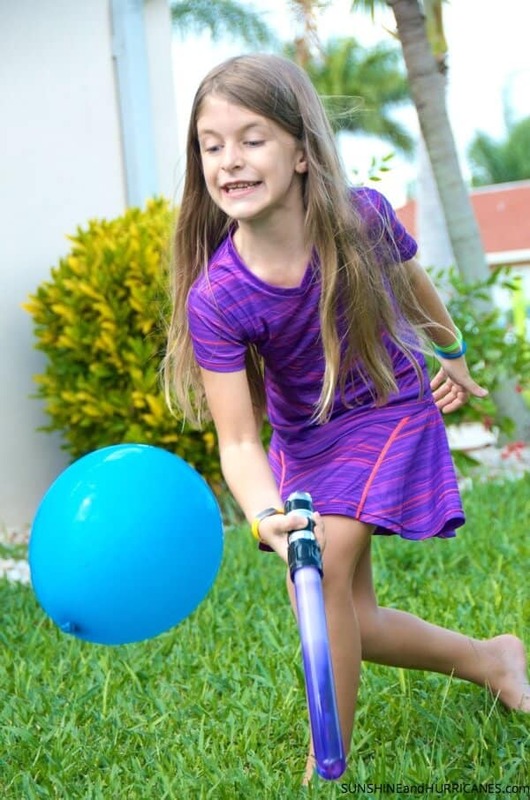 Daze and Nights also has some ideas on how to play tag using lightsabers (she made her lightsabers out of pool noodles This is an affiliate link: MomOf6 earns a commission if you purchase, at no additional cost to you. so they are softer for tag). 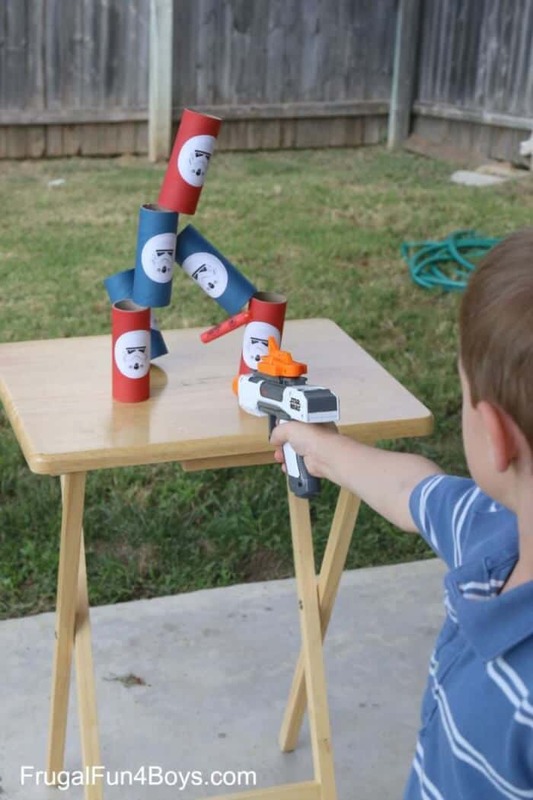 Frugal Fun 4 Boys has some cool ideas on how to make Star Wars themed target games for Nerf guns that younger tweens would love! And I am in love with this concept- creating a Jedi Training Academy for party guests with various obstacles to test the agility of these Jedis in training! (courtesy of Easy Breezy Parties). You can find some more ideas for Jedi training over on Hostess with the Mostess! 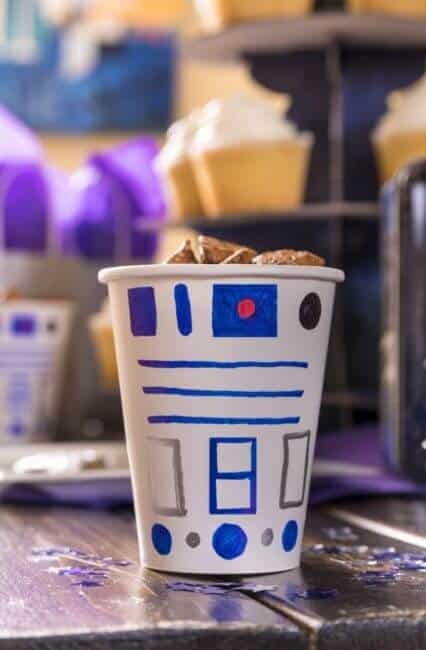 If your tween would like to include a craft activity- this R2D2 craft is a fun idea (courtesy of The Laws of My Life). Tweens still dig a pinata- and they would absolutely love this Death Star pinata- created “old-school” style- using a beach ball, newspaper, flour, and water! You can check out the instructions over on More Than Thursdays! 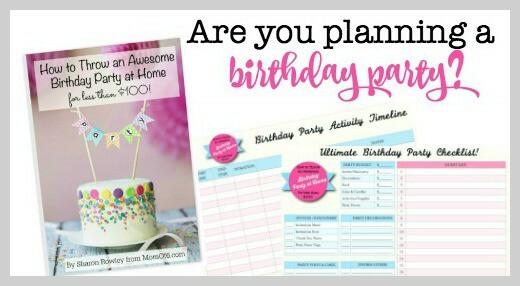 Then let me show you how to plan an awesome birthday party at home for less than $100! 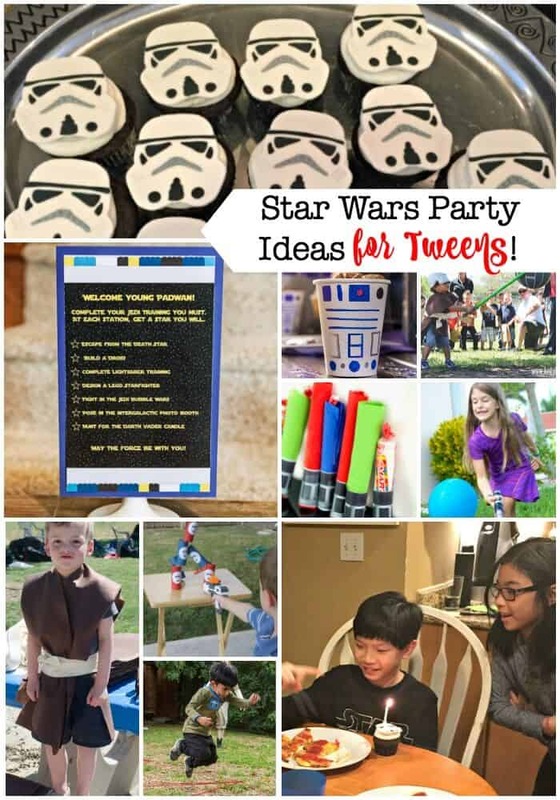 Would your son or daughter love a Star Wars themed birthday party? I'd love to hear about it if you hold one too! « 3 Sweet Printable Valentines Cards for School! Seems like a fun party. Party is pretty good. First movie then food then games. I love the cupcakes. Games which you have shared are really the enjoyable stuff and interesting one. Thanks a lot for sharing!